Riding a bike? Great! Riding a bike at night? Possibly dangerous. 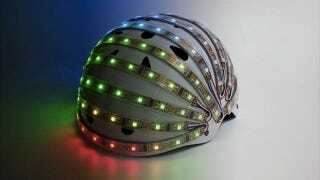 And even though dressing yourself in bright colors while wrapping 3M and reflective gear around your body is effective, illuminating your noggin is something bike riders don't do enough of. The LumaHelm would fix that. Sure, you might look like a giant glow in the dark caterpillar but the rows of light on lights are actually super useful. They can act as brake lights for when you stop, turn signals when you want to make a turn and anything else you want to do (a middle finger for cars who ignore bikers?) because it's an interactive helmet.